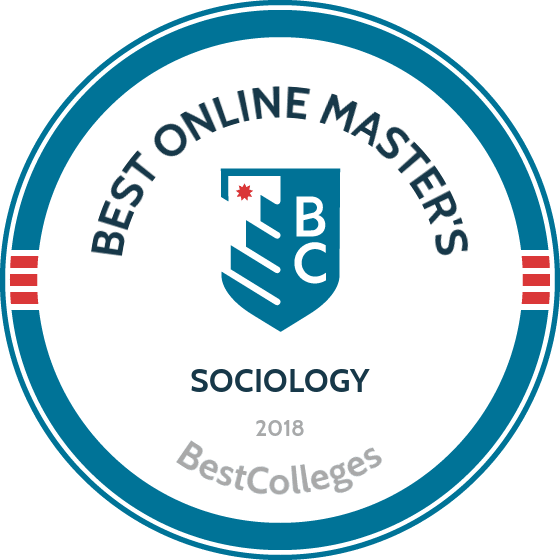 What are the Best Online Master's in Sociology Programs? What Else Can I Expect From an Online Master's in Sociology Program? When you pursue a master's in sociology online, you prepare yourself for a variety of meaningful careers focused on community service and bettering society as a whole. Sociology is primarily an academic discipline that studies human interaction and culture, and an advanced degree in the field is perfect for those who work well with others and wish to make the world around them a more just and positive place. Many careers within sociology are in high demand. The U.S. Bureau of Labor Statistics (BLS) projects that community service management careers -- a common path for those with an online sociology master's degree -- will grow 18% over the next 10 years. Sociology graduates have the skills and knowledge to understand how society works, which can be especially valuable when assisting those in need or developing successful programs and services. Whether you go on to become a university professor, program manager, social worker, case manager, or a professional in a different field, earning a master's in sociology online is a great step toward achieving your career goals. UAB offers dozens of distance learning programs, including an MA in applied sociology program that can be completed in just one year of full-time study. The 30-credit curriculum consists of nine courses on topics like applied sociological theory and applied social psychology. All learners take five core courses. Students can also choose from a wide variety of electives on topics like consumer culture and the sociology of death and dying. The program concludes with a culminating capstone experience that students can complete in their local communities. Applicants to this online sociology master’s degree program must have an overall GPA of 3.0, based on a 4.0 system, or a 3.2 GPA for the last 60 semester hours in a BA/BS program and have completed 12 hours of coursework in the social sciences to be considered. All online students pay the same tuition rate, regardless of residency. VCU offers a fully online master of science in sociology program that is ideal for students who aspire to work in urban settings. This program can be completed in just two years of full-time study and prepares graduates to work for urban improvement programs in their home communities. The 36-credit synchronous curriculum emphasizes seven learning outcomes that stress mastery of topics such as theory, culture, and research methodology. Core courses cover a variety of topics including public sociology, digital sociology, and data visualization. In their third and fourth semesters, students must undertake independent research projects. Applicants must submit undergraduate transcripts and three letters of recommendation to be considered. They do not need to submit any standardized test scores. Virginia residents pay roughly 50% less for tuition than their out-of-state counterparts. NMSU offers a variety of distance learning programs, including a fully online master of arts in sociology program that emphasizes data analysis, an essential skill for leadership positions in the sociology field. This program can be completed in two years of full-time study. The 36-hour curriculum consists of six core courses in the first year and six electives in the second year. First-year courses cover topics like classical sociological theory and quantitative research methods, while elective classes cover topics like international migration and sociology of education. Students may select either a thesis or non-thesis track. All applicants must have completed at least three upper-level undergraduate sociology classes to be considered. NMSU may admit applicants with an undergraduate GPA below 3.0 on a provisional basis. Transfer students can apply up to nine credits toward their degree. ASU offers an online master of arts in sociology program that can be completed in just 15-18 months. The programs prepares students to pursue careers as HR professionals and child protective services agents. This 30-credit master's in sociology online program includes 10 courses, each of which can be completed in roughly eight weeks. The curriculum includes courses on a variety of topics, such as social change and leadership and social justice. The program culminates in a nine-credit capstone experience. Applicants must have a minimum undergraduate GPA of 3.0 to be considered. They do not need to submit standardized test scores. All online students pay the same tuition rate, regardless of residency. ASU is regionally accredited by the Higher Learning Commission. SHSU offers a master of arts in sociology program with four specialization options: environment, social change, and development; culture and institutions; stratification; and applied sociology. Full-time students can earn their degree in just two years. Graduates are prepared to pursue a variety of careers in sociology. This 36-credit degree program boasts small class sizes and offers two degree path options. In the thesis option, students must complete more core courses to prepare for their thesis. In the comprehensive exam option, students enroll in more electives and must pass a comprehensive exam at the end of the program. Applicants must have a minimum undergraduate GPA of 3.0 to be considered. They do not have to submit any standardized test scores. Texas resident pays roughly 50% tuition than their out-of-state counterparts. Below, you will find a sample list of courses commonly offered through online master's degree programs in sociology. While course options differ between schools, this list should give you a good idea of the options available upon enrollment. Methods in sociology: This course provides a cohesive introduction to the methods commonly used in sociological inquiry, including social network analysis, comparative research, and ethnography. Students learn how to incorporate these methods into research. The class prepares students for their capstone projects. Economic sociology: Students examine some of the most controversial issues in sociology, including the effects of capitalism, modernization, and development on communities and societies. The course also covers issues such as labor, entrepreneurship, inequality, social justice, and class systems around the world. Fundamentals of ethnomethodology: This subset of sociology centers on the different ways members of a society can produce objects, actions, and events in ways that all can understand and agree upon. Specifically, students examine the social processes and norms that support various social phenomena, such as social structures, gender, race, and culture. Sociology of religion: This course covers the relationships between society and religion, including the study of various religious symbols, practices, languages, and communities on a global scale. Students also explore historic and emerging religions, including how they affect cultures and ways congregations and denominations handle conflict. Macro organizational theory: Students learn about the origins, maintenance, and decline of organizations in human cultures, including a variety of theories regarding why these structures exist and how they succeed or fail. In many cases, the course establishes sound research ideas for students' final capstone projects. How Long Does It Take to Get an Online Master's in Sociology? While most students can earn an online sociology master's degree in two or fewer years, many factors influence program length. One of the most significant factors is whether you can learn at your own pace or if the program is taught in a cohort format. In the former arrangement, you can take more credits each semester or term and finish your degree quickly. Cohort learning requires you to take all or most of your classes with the same group of students, limiting you to the pace of the cohort. Students enrolled in sociology master's programs online generally take 32-40 credits, depending on the format of the program and whether the school follows semester or quarter terms. It is important to identify a regionally or nationally accredited online master's in sociology program. When a school or program holds accreditation, it has met rigorous curriculum and instruction quality standards. Regional accreditation holds more prestige, although there are many nationally accredited colleges and universities offering top-tier academic programs, including those in sociology. When looking at potential online master's degree programs in sociology, search for those accredited through regional agencies like the Higher Learning Commission, the Middle States Commission on Higher Education, or the Northwest Commission on Colleges and Universities. The most common national accrediting body is the Accrediting Council for Independent Colleges and Schools. In addition to the school overall, specific programs may also receive accreditation. There are two main agencies that oversee the practices of the accrediting bodies themselves. The U.S. Department of Education maintains a full list of approved agencies. There is also the Council on Higher Education Accreditation, an independent nonprofit that maintains strict standards for how accrediting agencies must go about evaluating colleges, universities, and programs. It also maintains a list of approved accreditors. A full list of reputable accrediting agencies is available at the U.S. Department of Education's website. While sociology is not necessarily known for its lucrative pay, there is room for income growth. Sociologists, for example, tend to bring in significant salaries as they gain more experience. The amount of money you can make with a master's degree in sociology may vary depending on your workplace, your level of experience, and your career goals. The following table features income data for various professions in sociology. There are numerous career paths for those who graduate with an accredited online master's in sociology degree. A common thread among sociology careers is that they are service oriented. If you are friendly, tolerant, and passionate about making a positive difference, you are likely to succeed in these careers. Responsible for creating, implementing, and evaluating programs and services for a community,these professionals play an important role in the health of society. They conduct community needs assessments, plan outreach activities, write grants, and ensure programs meet objectives. Community service managers typically work for nonprofits and government agencies. Working directly with individuals and families, social workers help address a variety of challenges, including substance abuse, poverty, unemployment, and illness. They often connect people with key resources like food assistance, healthcare, childcare, and other social service providers. Social workers also find themselves assisting individuals with mental health issues. These specialists ensure employees have the skills, training, and resources necessary to be successful in their jobs and careers. They may use various instructional techniques, evaluate training methods, and draw from diverse sources and materials as they design the best possible programs. Some individuals with a master's degree in sociology become college instructors, teaching courses within their area of expertise. This involves planning lessons and grading assignments, developing exams, and working with students to ensure they have a grasp of course material. These professionals work with individuals and families experiencing the effects of drug and/or alcohol abuse. They work with a wide range of people, including children, teenagers, adults, and senior citizens. It has become an especially important field as the country continues to deal with a worsening opioid crisis. As you review the best online sociology master's programs, consider joining a professional organization related to the field. These groups provide valuable networking opportunities, especially for those just beginning their careers. The five organizations listed below offer continuing education, career services, job boards, and annual conferences. The ASA promotes sociology on a national level, advocating for responsible social policies and programs. Founded in 1905, this nonprofit organization has more than 21,000 members and holds events throughout the year. This global organization began in 1948 and provides valuable resources, continuing education, and networking opportunities for those in the sociology field. The ISA offers both individual and collective memberships. The largest social work membership organization in the world, NASW provides professional development, networking, and continuing education to its more than 120,000 members. It also promotes beneficial social policies at the federal level. AHS focuses on improving social justice, peace, and equality, taking a people-first approach to these issues. Founded in 1976, the association's mission is to make sociology more relevant in addressing people's everyday needs. The RSS works to enhance the quality of life found in rural communities, leveraging its global membership of academics and professionals. It has a peer-reviewed journal and hosts a yearly conference. You have some options when it comes to financing your online sociology master's degree. To start, be sure to fill out the Free Application for Federal Student Aid (FAFSA) to determine if you qualify for financial aid, whether it's in the form of grants, scholarships, low-interest loans, or work-study awards. You should also explore funding opportunities within your prospective program, along with scholarships offered specifically to those seeking sociology degrees. Exploring these resources can reduce your student loan debt and make your higher education journey possible.